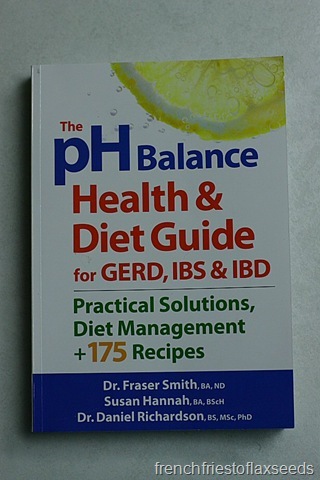 The book I’m looking at today is The pH Balance Health & Diet Guide for GERD, IBS & IBD by Dr. Fraser Smith, Susan Hannah, and Dr. Daniel Richardson, published by Robert Rose Publishing. It is meant to be offer “practical solutions, diet management, and 175 recipes” to help those with digestive woes such as Gastroesopageal Reflux Disease (GERD), Irritable Bowel Syndrome (IBS), and Inflammatory Bowel Disease (IBD). All of these conditions can be debilitating if not managed properly, and may even involve surgery to help alleviate symptoms and allow the individual to lead a happier and healthier life. And because they involve the digestive tract, diet can definitely play a big part in managing these conditions. I was particularly interested in this title, as I have heard and read various opinions on the idea of an alkaline diet, and using pH to determine health. You see, our bodies are designed to do a really good job of keeping our pH in a very narrow range. If they didn’t, our enzymes wouldn’t work properly, and we wouldn’t work properly either. I have often seen books where it’s all about measuring the pH of your urine or saliva, which doesn’t exactly tell you anything about what’s going on in your blood, as your blood is buffered to stay in it’s optimal pH range. And let’s be honest – peeing on a little piece of litmus paper isn’t the easiest or funnest thing to do on a regular basis, especially if it’s not telling you that much. I definitely went into reading this book with some skepticism, given my previous experience with those touting pH as the way to manage health conditions. I was pleasantly surprised though. The authors of this book (which include a Naturopath, research associate, and professor of pharmacy and nutrition), do a really good job at not only explaining exactly how pH works in our bodies (in probably as much detail as we learned in university), but also how they are only focused on microchanges in pH, realizing that we cease to function if we have severe pH changes. They also have great information on each condition, including the symptoms, conventional treatment options, and complementary or alternative treatment options. The authors also take a fairly modest approach to their diet recommendations. Most alkalizing foods (the ones they want us to eat to alleviate symptoms) are ones that any dietitian would recommend anyways – vegetables, fruits, whole grains. They advocate for reducing the amount of acidifying foods – meat and dairy products – but do not take a “do not eat these ever” approach. They also recommend reducing processed/refined foods, and excess sugar and salt intake. In fact, they recommend eating a diet that is 60 – 80% alkalizing foods and 20 – 40 % acidifying foods, meaning that nothing is off limits – which is pretty much what I tell people every day. There are sample meal plans included, which were designed with a registered dietitian, and also meet nutritional guidelines such as Canada’s Food Guide and My Plate from the US government. Heck, those guides are even included in the book. That was not something I was expecting for sure! The authors do a good job of balancing information about conventional therapies, such as medications and surgery, as well as complementary therapies, and note that they are all important to these digestive conditions. They don’t take a stance on conventional medicine being bad, which I think is great, because we need to respect all types of treatment. They also make notes of seeing a registered dietitian a few times in the book, which makes me happy that they respect the role my profession can play in the treatment of these conditions. The recipe section I found fascinating. When you turn to the end of the book, you’ll see that the recipes actually all come from other Robert Rose Publishing titles – so the authors have chosen recipes from other books that they feel meet the criteria for alkalizing foods. I looked at some of the titles, and I even own some of those cookbooks (and there are recipes from some of the Dietitians of Canada cookbooks included). While there are fair number of recipes that are gluten free, as wheat is apparently a more alkalizing grain than some others, not all recipes exclude wheat. There is also some emphasis on vegetarian and vegan foods, but don’t worry meat eaters, there are also options for you. I actually think it has a nice range of recipes, both in terms of meeting people’s tastes, but also their cooking skill levels. Some recipes are super simple to make, and can be done from things you probably already have in the kitchen. Each recipe also includes nutritional breakdowns for you. I actually tried 2 recipes from the book. 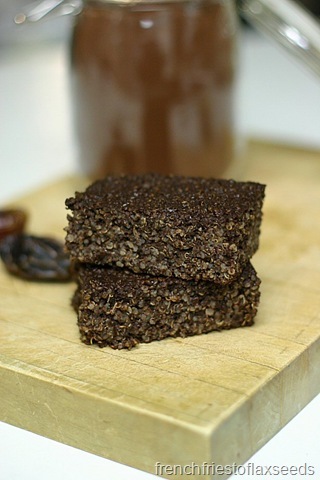 The first one was the Cocoa Quinoa Breakfast Squares. 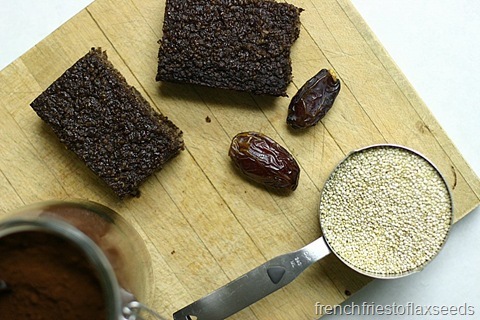 I figure with chocolate, dates, and quinoa, how can you go wrong? I had high hopes, and while they were good, they weren’t as amazing as I thought they might be. On their own, I wasn’t a huge fan, and didn’t find them as portable as they made them seem. But I did enjoy them crumble into a bowl of Greek yogurt, with a bit of peanut butter and dried cherries. Plus they gave me an idea for a completely different recipes. 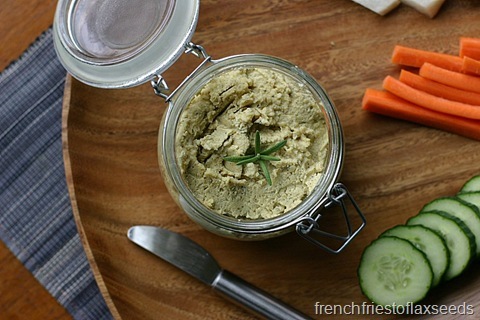 The second recipe, and the one I’m going to share with you today, was for Herbed Cashew Cheese. 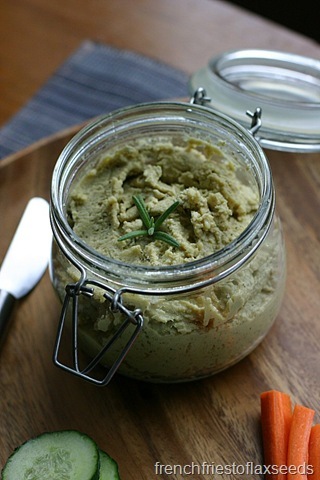 I have always wanted to make some of my own vegan nut cheese, but have never done it until now. It helped that I had some raw cashews hanging out in the cupboard. It turned out really well. I wouldn’t exactly call it cheese, as I find it a bit too sweet compared to most cheeses. I would consider reducing the amount of lemon juice if I made it again, or adding more spices like garlic and onion to give it a really nice savoury flavour. It had great texture though, and made for some tasty lunches on some whole grain crackers with veggies. I bet it would make an amazing sandwich filling with some avocado and veggies as well. Overall, I was pleasantly surprised with this book. I had these ideas in my head that it was going to be totally out there, lack a lot of good science, and be filled with nutrition information that I couldn’t actually recommend. But the ideas presented were actually practical, and would work for many people without major lifestyle changes. I would always recommend working with a nutrition professional and your health care team to really fine tune any diet changes to manage digestive symptoms, and to ensure you are getting all of the nutrients you need to maintain your health. I’m really glad I had the chance to give this a read, as it gives me just another tool in my dietitian tool box. This “cheese” is as creamy and filling as traditional cheese. 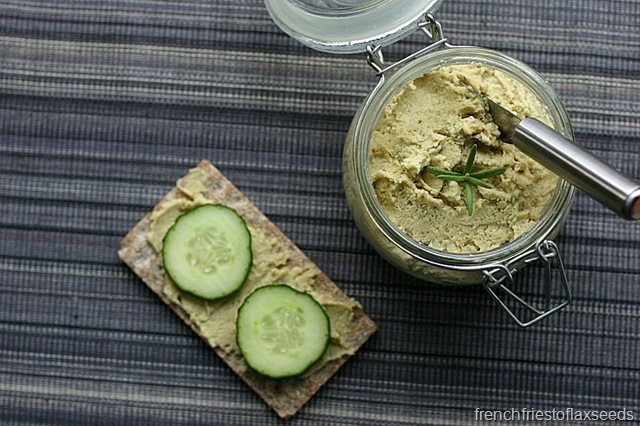 Use it as a dip with fresh veggies or as a spread on crisp romaine lettuce leaves. 1. In food processor, combine cashews, water, lemon juice, nutritional yeast, thyme, and salt; process until smooth, stopping motor to scrape down sides of work bowl as necessary. 2. Transfer to a bowl. 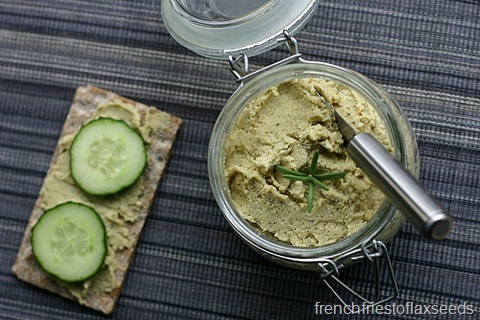 Serve immediately or cover and refrigerate for up to 4 days. Notes: Substitute an equal quantity of pine nuts or macadamia nuts for the cashews. If using macadamia nuts, increase water by 2 tbsp. Substitute an equal amount of chopped fresh rosemary for the thyme.